This history hunt doesn’t go back quite as far in time as some of the others. Can you identify the location of this picture from the early 1990s? 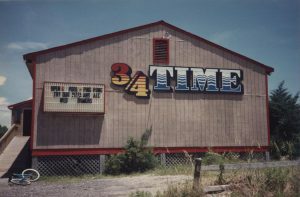 Clearly, the name of this place was “3/4 Time.” However, I would like you to tell me what this building is currently being used for and/or where it is located. You could win an Ocracoke license plate birdhouse. Anyone is welcome to enter. However, prize preference will be given to island visitors (past or present). All correct entries received by 5:00 p.m. on Friday, August 18, 2017 will be entered. One winner will be chosen at random. One entry per person, please. For an entry to be considered correct, it must be clear to our judges that you know where this is, so please make your description of the location as clear as possible. The decision of the judges is final. You do not need to be on Ocracoke to win. Birdhouse will be shipped to any deliverable address in the 50 states of the U.S. The History Hunt has now ended and the winner will be notified soon. Thanks for participating! 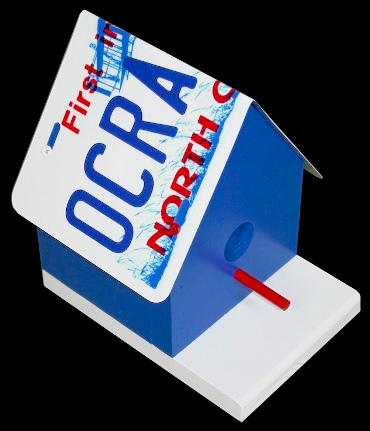 The History Hunt winner will receive an Ocracoke license plate birdhouse like the one shown below.